There were so many big lessons for this week that we broke this post into 2 parts, and still had to pull out three big stories as separate articles. Here’s Part 1, focused on the big developments and lessons from the US for this week and beyond. One is the fate of the taper, based on the current jobs picture. The other is, of course, the fate of the US stock market rally. Even if in fact the disappointing results were heavily due to the weather, and there is evidence that they were, this report has all kinds of ramifications for at least the coming month, when February’s job reports either refutes or confirms what happened last Friday and all the possible ramifications. See here for the full details in our special report on what it all could mean and WILL mean in the weeks ahead. See here for the full special report. Although the Fed policy is guided more by data than the personal biases of the FOMC’s voting members, it’s worth noting that the rotation of voting members leaves the Fed with a bit less dovish bias. Some have made a big deal about the change in composition of the voting members, but it’s not that big a deal. Yellen Not As Dovish As Reputed? Although Yellen is a vocal dove who gives growth a higher priority than low inflation, her vote to taper asset purchases in December suggests she may not be as dovish as is widely believed, which actually isn’t saying much. She’s still a dove, handpicked by other doves. Who’s Out: Two major doves, Evans and Rosengren, (favor easier versus tighter monetary policy), one moderate hawk who favors tighter policy (George) and one centrist (Bullard). Plosser and Fisher, two major hawks, Pianalto a moderate dove and Kocherlakota, who shares a similar (Dovish) bias as Yellen. 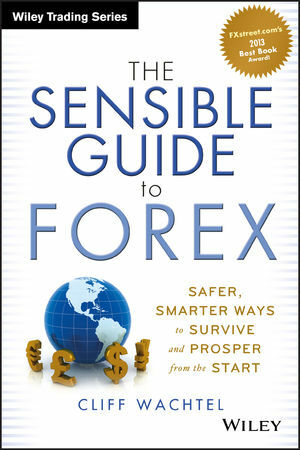 Former Bank of Israel Governor Stanley Fischer is reputedly less dovish than Yellin (who he replaces), and was just confirmed this past week as Fed Vice Chairman. Congrats from here in Jerusalem, Stanley. Our loss is America’s gain: Y’alla Stanley, harbeh mazal vebracha vetihiya kiddush Hashem gadol (rough translation: go Stanley, knock ‘em dead). The other two new nominees besides Stanley Fisher are Lael Brainerd and Jerome Powell. Like Fischer, they are mild doves. 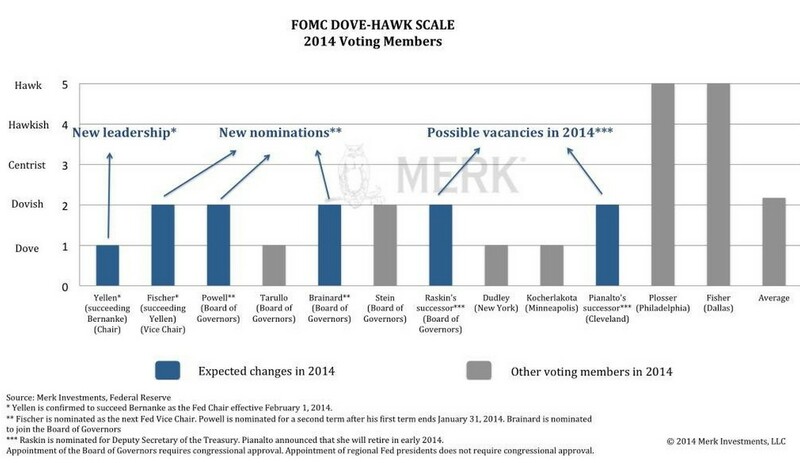 So on balance, from what we know so far, the FOMC contains more hawkish voting members in 2014. In theory they’ll be more inclined to continue reducing asset purchases by $10 billion at each subsequent meeting, per Bernanke’s parting recommendation. In theory that’s bullish for U.S. rates and positive for the dollar. But given the above graphic, let’s not make too much of this – the Fed is still Dovish (consider who most influences the nominating ), just a bit less so. Again however, its US jobs, growth, and inflation data that will be the biggest influence Fed policy in 2014, and thus will also heavily influence the fate of US and global interest rates and asset markets. While the Fed has more influence over US rates than any other single entity, it’s unclear how far that influence extends, especially if 2014 is more turbulent. As we discuss here another bout of EU crisis is possible. US Recovery Weak? Compared To What? The NY Times reported that Harvard economists Carmen Reinhart and Kenneth Rogoff say the US recovery isn’t being given enough credit. While the ongoing US recovery may be weak relative to other US post war recoveries, it’s robust when compared to at 100 “systemic” crises that have taken place in the last 200 years in the U.S. and abroad. For example, in nine major US financial crises, the recovery period to the pre-crisis peak was 6.7 years, and the average decline in per capita GDP was 9%. In the current recovery from the Great Recession that began with the US subprime crisis, per-capita GDP dropped “just” 5% and the rebound took six years. This may be little comfort to the decimated middle class, but it does provide some added credibility for the slow but ongoing recovery. Just because it’s weak doesn’t mean it isn’t real. US earnings season officially kicked off with Alcoa’s (AA) disappointing report. The materials sector shrugged off the Alcoa’s earnings miss after getting some support from miners (up as the poor jobs report reduced taper odds, weakened the USD, and so sent gold and other PM stocks higher) and steelmakers (who benefit from a weaker USD). This week begins the second week and start of the real earnings season, which is most influential in its second and third weeks.